YouÂ had a busy week. You didn’t mean to, but you almost forgot to send flowers or a gift to your mom for Mother’s Day. It is not too late to make Mother’s Day special for the her. Luckily, Â I have compiled a quick list of resources you can use to order flowers, gifts and make reservations for Mother’s Day meals. Goodies From Goodman makes lovely floral arrangements for all occasions. I have used them many times for my clients. 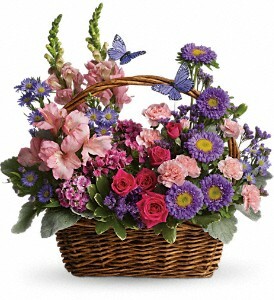 Goodies From Goodman‘s floral department has designed several bouquets with mom in mind. You can order online and have them shipped right to Mom’s door. Most arrangements come in 3 sizes and for a little extra, you can add a plush teddy bear, scented candles or even balloons. Voted Best Florist in Dallas by D Magazine, Dr Delphinium is known for their elegant floral designs. Kids can also show Mom how much they care. This year, Kids get a Free flower for Mom at Dr Delphinium when they drawÂ a picture that explains “Why does your mom deserve flowers on Mother’s Day?”Â Simply Â download, print and complete this page and bring it to the store at 5806 West Lovers Lane by May 8th, 2011 for a FREE rose for your mom! Take her out for a special lunch or dinner at The Capital Grille, Villa-O or Victory Tavern orÂ treat Mom to a relaxing day at The Spa at the Â Stoneleigh Hotel. Treat Mom like a queen this Motherâ€™s Day at the enchanting V Spa at Hilton Anatole. V Spa is offering 3 Motherâ€™s Day spa specials throughout the month of May. Whether your mom enjoys a champagne brunch or a casual dinner, OpenTable is a great way to make reservations at your favorite restaurants. Check out this list os special Mother’s Day dining events in Dallas, with many restaurants offering complimentary mimosas, Bloody Marys, and champagne for moms. OpenTable lists more than 20,000 restaurants nationwide and they also have apps for you mobile phone, making it even more convenient to make your dining reservations.